I had become complacent and my weight kept creeping upward. I wasn't doing anything for me. I was exhausted. I worked very hard to present myself in a positive way. I felt like I had to be 'on' when I was at work or dealing with people. I bought expensive clothing from the 'big girls store'. I just didn't feel like eating healthy foods, taking care of myself or even my home. 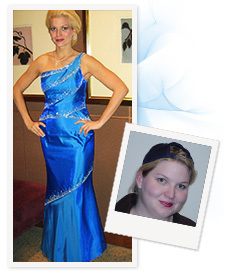 The year before my surgery, I tried everything to lose weight. I bought exercise equipment, went on all shake and broccoli diets. I did it all. Each one for eight weeks. I gave it my all, got frustrated, gave up and then started the next diet right away. I was very determined. I spent $10,000 that year on weight loss. My doctor mentioned weight loss surgery. I didn't really understand what he was talking about. I started to slowly check it out. I took my time. It was 2 years from the time he mentioned it until I had my surgery. I searched the Internet and found some message boards that had both positive and negative comments. One day, I typed in bariatric.com and ended up at the Barix Clinics website. It was full of helpful information. I called the 800 number and a live person answered. I was so scared that I hung up on her. But, I gathered my wits and called back. She interviewed me over the phone and pre-qualified me. I wanted to do my research so I contacted two other bariatric surgeons and went to consultations. Barix was actually the third clinic that I went to. I met directly with the surgeon and nurses. They invited me to a support group right away. They had a nutritionist on-site to help you afterward. I liked the fact that bariatric surgery was all they do. I looked at the statistics-the success and failure rates, the mortality rates. It was all about me. That sounds a little selfish, but if I was doing this for me, I wanted it to be all about me. I have the courage to do things that I have never done before. I have my life back. I can enjoy my passion for the theater. I get up on stage and tap dance without people thinking, "look at the fat girl." In 2004, I entered the Miss Illinois USA Pageant and had to walk on stage in a swimming suit. I had support from the Jaycees and the comic book store. Everyone was really rooting for me. In January, I was crowned Mrs. Illinois United States 2008, and will be going to Nationals in July to meet 51 other beautiful married women and share my story. My focus is to get healthier food choices in schools so that children don't gain excessive weight and have to live the life that I did prior to my surgery. Barix is all about the patient, the surgery, and the science behind it. They constantly ask, "why does our program work, what do we need to change, what should stay the same?" I would say that Barix has been there every step of the way. I had a nutritional issue learning to eat again. They helped me through it. If my family doctor had a question, I had him call Barix. He did and he got the answers that he needed.